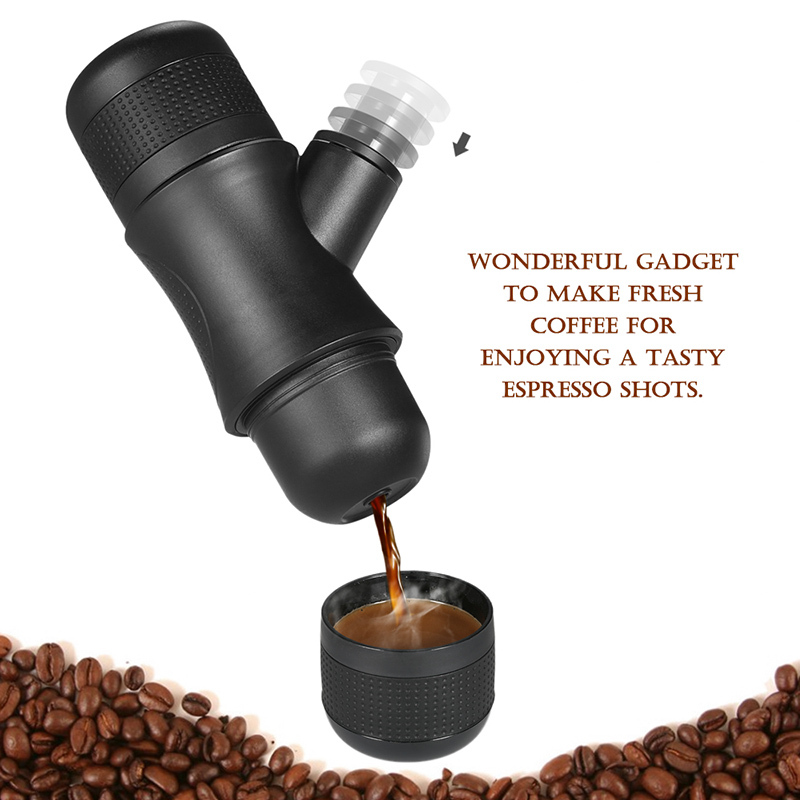 Successfully Added Portable Espresso Maker - 70ml, Hand Pump, No Electricity Needed, 8 BARS Pump, Fresh Coffee On The Go to your Shopping Cart. This portable Espresso machine is the ultimate gizmo for all traveling coffee lovers out there. No matter where you’ll be, from now on you can always enjoy a shot of outstanding coffee. All you have to do is add ground beans in your mini portable coffee machine, add hot water, and press the vacuum pump. Your mini coffee maker will then generate a delicious shot of freshly brewed Espresso for you to enjoy. This cool gadget works without the need of any batteries or external power supply. Thanks to this, you’ll be able to use it literally anywhere and anytime. If you are a truck driver that spends many hours on the road or a business man that often travels abroad, this mini coffee maker will become your best friend. No longer will you have to drink tasteless coffee in your hotel or road-side restaurant. With this Mini Espresso machine, you’ll be able to enjoy a first-class cup of coffee literally anywhere. Its tank supports up to 70ML water at once. This is enough to produce two great shots of Espresso at once. Thanks to its intergraded pump, you’ll be able to manually adjust the pressure that is used to brew your drink. Due to this, you’ll be able to adjust the taste of your coffee accordingly. Whether you enjoy a Ristretto or double espresso, everything is possible with this portable coffee machine. To use this cool gadget, all you have to do is add the amount of ground coffee beans of your liking. Once your ground beans are in place, add hot water into the tank. Now, simply use the hand vacuum pump to generate pressure and to create the strength of taste you enjoy most. After this, you’ll be all set to enjoy a magnificent shot of Espresso no matter where you are. For all coffee addicts out there, this gizmo offers a fun, easy, convenient, and fast way to brew a cup of coffee at any place. This portable coffee maker comes with a 12 months warranty, brought to you by the leader in electronic devices as well as wholesale electronic gadgets..